U.S. Patent 7,513,720. Other patents pending. For use with a variety of thread-verification and thread-chasing powered Units. Eliminates jamming, cross-threading and off-axis re-cutting due to difficulty in aligning the tool with the threaded feature. Also used in applications where metallic adhesions (on the thread gage member or chasing tool) would otherwise be a problem. Will find and follow threaded holes (or external threads) that are out of position up to 3.5mm (.140”) true position; and, for specialty applications, out of square up to 3º. 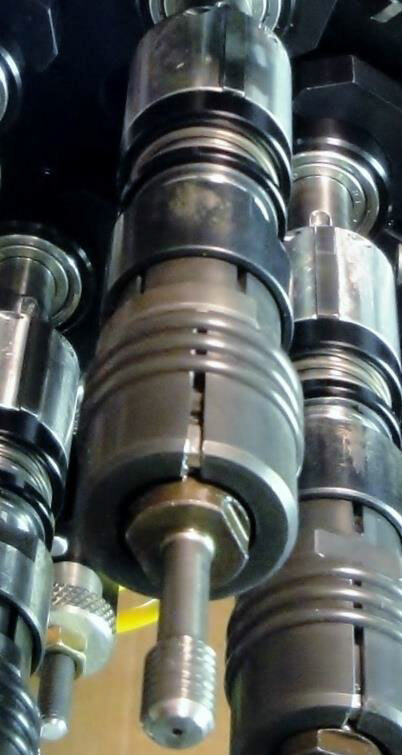 Photo shows DRGN Quick-Change Toolholders in a multi-spindle cluster of 6. This particular set runs taper-shank solid carbide thread gage members. The DRGN Series Toolholders are supplied in three sizes. 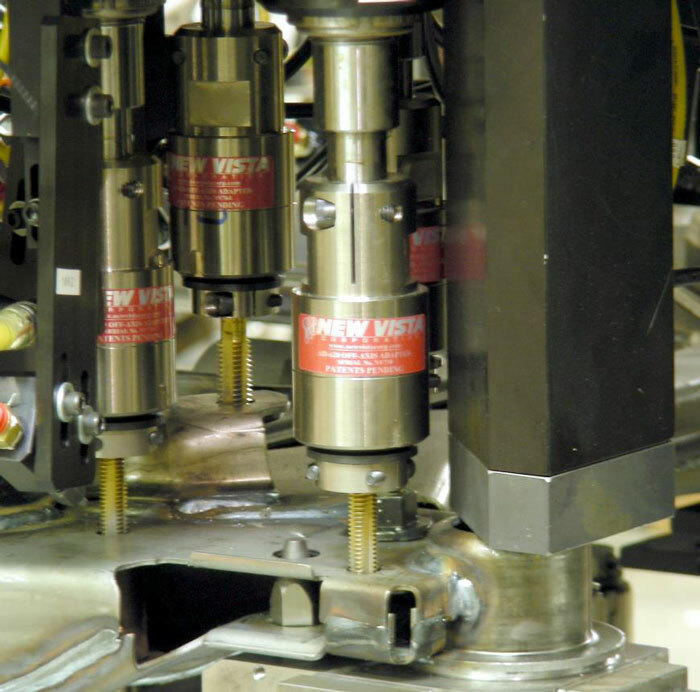 They are used in a variety of high production applications, often where Auto-Change or Quick-Change features are required, or where clearances are limited. In the smaller sizes they will accommodate Ø1.20mm (Ø.048”) true position, which is an offset from centerline of 0.60mm (.024”). The larger sizes will accommodate Ø2.00mm (Ø.080”) —— an offset of 1.00mm (.040”). Angularity compliance settings are available up to 1-1/2⁰.